I think I've already established that I'm quite the Wes Anderson fan. His movies remain consistently high concept and I love how he's trying to do something refreshingly different with films. Sure, this is probably one of my more "hipstery" interests, but it's one that I feel is more than worth the occasional confused stares. So when first trailers for The Grand Budapest Hotel started coming up, I was automatically excited. And while that may sound like a pretty irrational reaction to get all excited over a mere trailer, but the visual snippets in that brief trailer alone were enough to sell me. And given my general experience with most of his movies, I could tell that I was in for a treat. It took a while before we were able to actually watch this movie - boo you Ayala Cinemas for your exclusive release - but with that finally out of the way, I can now write a proper review. And while this may not be my favorite Wes Anderson move just yet, it's still quite the experience. 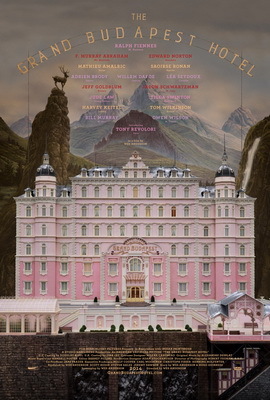 Synopsis: The Grand Budapest Hotel is a 2014 comedy movie written, directed and produced by Wes Anderson. The story is stated to by inspired by the writings of Austrian author Stefan Zweig. The movie involves a story within a story within a story - in this case a little girl reading a book by The Author (Jude Law), wherein he talks about his trip to the Grand Budapest Hotel, and there he is told a story in turn. And each timeline or story level or whatever was filmed in a different format / aspect-ratio. Thus in 1968, The Author meets a man (F. Murray Abraham), who turns out to be the owner of the hotel and he goes about telling him how he came to possess this particular structure. So the bulk of the action takes place in 1932, when the owner was no more than the lobby boy, Zero (Tony Revolori) working under the mentoring of the hotel's concierge Gustave (Ralph Fiennes). Gustave is extremely dedicated to the hotel and its well-being along with the many older women he happens to wine and dine. One such client is Madame D (Tilda Swinton in a lot of make-up), who turns up dead a month after her last time at the hotel. Thus Gustave (with Zero in tow dashes off to her wake and finds out in the reading of the will that she had left a precious painting to him - "Boy with Apple". Unfortunately, her son Dmitri (Adrien Brody) doesn't take well to such a valuable piece of art leaving the family. The movie takes a wee bit of time to setup, which by now is par for the course for Wes Anderson movies. And as it always the case, things will pay off later on as the movie picks up steam. And compared to other such movies, I think it manages this part of the narrative rather quickly, if only in comparison. I feel that Wes Anderson movies tend to follow a particular spectrum with coherent narratives on one side and increasingly exotic visuals. This is not to say that the two are mutually exclusive - but movies do tend to have different degrees of these two things. And while still had a lot of stunning visuals, it felt a lot more coherent than others. And that's not a bad thing - just a different Anderson experience. I think I lost count of how many cameos were included in this movie in terms of the Wes Anderson regulars. It seems that once you've starred in one Wes Anderson movie, you're bound to appear in another one. And I liked how everyone was integrated into the narrative, especially since a number of them had previously performed the role of the lead in those older movies, but still do just as well in minor, supporting character niches. I wasn't quite sure what to expect from Ralph Fiennes as the lead, but he did perform quite admirably. Tony Revolori was quite the endearing lobby boy and manages to hold his own decently enough given the number of scenes he has to share with Fiennes. Everyone else pretty much fades into the background given how much narrative attention is focused on this pair. And still, it's quite the fun little ride. The Grand Budapest Hotel is another lovely Wes Anderson adventure. It's the sort of movie that allows you to deposit all your troubles by the side of the door as you just let the movie wash over you. Thus the movie gets a good 4.5 surprise deaths at the hand of hitman J.G. Jopling (Willem Dafoe) out of a possible 5.